Will Füchse Berlin continue their magic run of victories, or can HC Vardar break the spell? Are FC Barcelona Lassa due a third title win to become record winners? Those are the main questions ahead of the eleventh edition of the IHF Super Globe, the unofficial World Championship for club teams. For the eighth successive year, the tournament is hosted in the Qatari capital, Doha. As per usual, the European participants are counted among the main favourites. 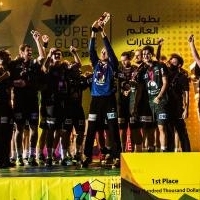 With the exception of Qatari side Al-Sadd in 2002, every IHF Super Globe winner has come either from Spain or Germany. But reigning VELUX EHF Champions League champions have not fared well in recent years: the last team to follow up a victory in Europe's elite club competition with this title were THW Kiel in 2011. Since then, Atletico Madrid (2012), FC Barcelona (2013, 2014), and Füchse Berlin (2015, 2016) have won the tournament. Berlin received a wild card in 2015 as reigning EHF Cup champions and grabbed their chance, beating Barcelona in the semi-final and Veszprem in the final. One year later, the foxes got the better of Paris Saint-Germain after an incredible comeback in the final. As defending champions, Berlin are again part of the event, which begins with the quarter-finals on Friday (25 August). Thanks to their sensational triumph at the VELUX EHF FINAL4 in June, Vardar have their first appearance at the IHF Super Globe, facing Asian club champions Naft-O-Gas-Gachsaran from Iran. The winner of this match will face the winner of Barcelona’s duel with the African club champions Esperance Sportive de Tunisie (Tunisia) in Saturday's semi-final. Berlin were drawn against Pan American champions Esporte Clube Pinheiros from Brazil and the fourth quarter-final features Super Globe hosts Al-Sadd against Oceania representatives, Sydney University Handball Club from Australia. The winners of those matches will make up the second semi-final. After a rest day on Sunday, the winner will be decided on Monday, 28 August. Live streaming of the event can be found on the Alkass YouTube channel.